I think I was five. Maybe six….no I was five. Six. Wait…four? No, five. Hell, it doesn’t matter… I was finally old enough to learn to ride my bike without training wheels. It was a monumental day. My bike and me were about to embark on new territory, make history, be BIG! She was a fabulous bike. The Seashell Princess bike. And after my dad removed her training wheels, she was legit! A machine of pink and silver shells and tassels. The only setback now would be me. She was ready. Was I? I waffled. I wasn’t sure. I thought I was. In his usual fashion, my dad cracked jokes and lightened the mood. He told me I could do it. So I did. My dad’s strong arms held me tight as I started to peddle. You know the drill….one minute I’m confident with him by my side, cheering me on and holding me steady. The next minute my face is implanted into a stop sign and Seashell Princess is scratched and bruised. He picked me up, made me feel better, and told me to keep trying. He wouldn’t let me give up. So I got back on her. She fought like a champ and I learned to ride without training wheels. Sort of. I’d love to say that was the last time I fell off of a bike…but sadly I am still a TERRIBLE bike rider. I try but I look like a blind woman who just drank two bottles of Jack and went for a joy ride….in sand. Ya, that bad. There are a lot of things that I am not great at (or even good), but I keep trying. Sort of. 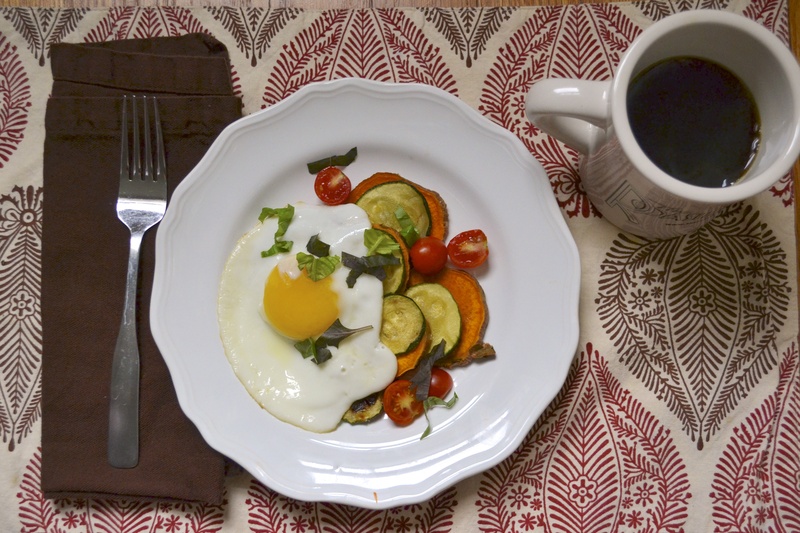 There is one thing that I am good at….breakfast. I also love things stacked on my plate so that my eggs can drizzle and dribble all over them. I totally love english muffins, but in my recent quest to remove gluten from my diet, the english muffin has been replaced by über delicious sweet potato and zucchini stacks. Oh Honey…let me tell you how much I love these things. Flavor is A +. Texture is great….And I don’t feel bogged down after eating them. Mmmm. This is especially good with fresh torn basil scattered on top. So. Good. So try something new. Hopefully you won’t face plant into a stop sign. But in the event that you do….brush yourself off and try again. Preheat oven to 425 F. Spray a roasting pan with nonstick spray or drizzle with olive oil. 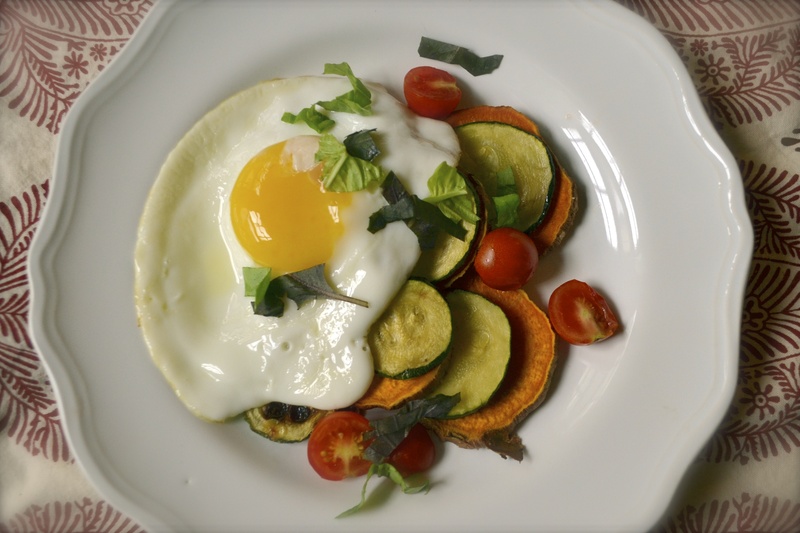 Layer sweet potato rounds and zucchini rounds in a single layer on the roasting pan. 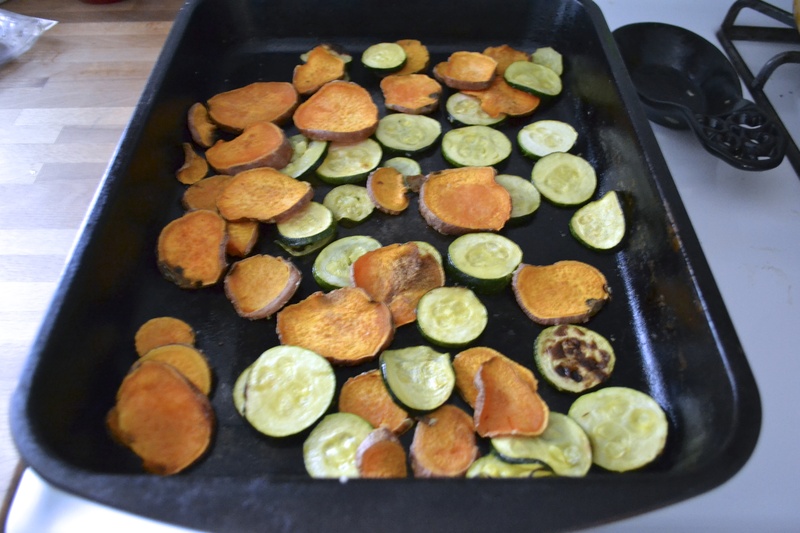 Roast sweet potato and zucchini at 425 for 20 to 25 minutes, or until cooked through. Remove from oven. Either fry or poach eggs as desired. Split the zucchini and sweet potato rounds between two plates. Place 1 or 2 cooked eggs on each stack. Top with diced cherry tomatoes and fresh basil. Season with salt and pepper.